Bus from Ipoh to KL is one of the highest frequency routes plying between Ipoh and Kuala Lumpur. From morning as early as 415am until the 9pm night, almost every 30 minutes, there is a bus leaving Ipoh for Kuala Lumpur. Even with the Electric Train Service (ETS) provided by KTM, bus is still the preferred transportation by locals because of the schedule frequency and comfort in the bus. Tourists, who wish to view the landscape of Ipoh (Ipoh is also known as mountain city in Malaysia) and Gua Tempurung (famous cave near Ipoh), are advised to take the bus. This is because tourists could view the Gua Tempurung and mountain terrain from the bus while the bus passes though the mountain area in North South Highway. Plusliner, Konsortium and Transnasional are the the famous brands serving bus from Ipoh to KL. Locals prefer the these brands because of their punctuality and high frequency of schedule. Another quality bus company is Kesatuan Express who provides executive 27 seater coach. Their fare for bus from Ipoh to KL is around RM 20.00 – RM 22.00 per ticket depending on the bus type. Duration required for bus from Ipoh to KL is about 2 hours depending on traffic condition. Washroom break is provided upon request. Departure point for the three brands is at Aman Jaya bus terminal, Ipoh. Aman Jaya bus terminal is about 10 minutes away from Ipoh city center. Taxi and city bus are available for passengers to travel from Ipoh center to Aman Jaya bus terminal. Please take note that authority has closed down Medan Gopeng bus terminal since 2013. Any bus pick up in Ipoh city is considered illegal by authority. The arrival point in Kuala Lumpur varies depending on the bus chosen. Both Plusliner and Kesatuan coaches terminate at Pudu Sentral, which is at Kuala Lumpur city center. As for Transnasional coaches, they terminate at Duta bus terminal, which is at the north of Kuala Lumput city. Therefore it is important for users to check your next destination in Kuala Lumpur carefully before buying the ticket online. Taking bus from Ipoh to KL is convenient, flexible and comfortable. 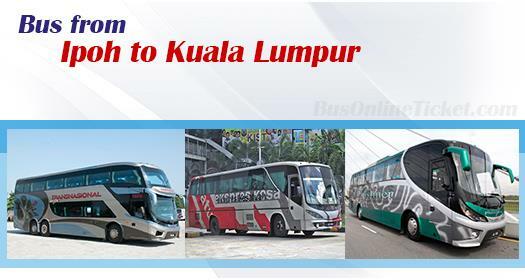 Now it is even more convenient by booking Ipoh to KL bus ticket online at BusOnlineTicket.com with instant confirmation. BusOnlineTicket.com also offers discounts occasionally for all their passengers who book Ipoh to KL bus ticket online as a form of loyalty and appreciation, no matter the pioneers or newbies. As a result, this makes BusOnlineTicket.com to be one of the most credible and reputed online booking portal among its customers throughout these years.